Sagga pyaz is just another name by which spring onions or hara pyaz are know as in UP, eastern Uttar Pradesh to be precise. Sagga pyaz literally means greens of onion or pyaz ka saag and even a saag (stir fried greens) type recipe made with this is known as sagga pyaz. Spring onions start appearing in the early winters and keep coming to the markets till spring. There are many winter recipes that use spring onions and the alu hare pyaz ki subzi is one of the favourites. Carrot and spring onion paratha is another recipe we love, it is added to our everyday omelets and scrambles by the handfuls. Spring onion and potato soup is a regular too every winter, sagga pyaz ke pakode takes the cake whenever one craves for some pakodas during winters. . 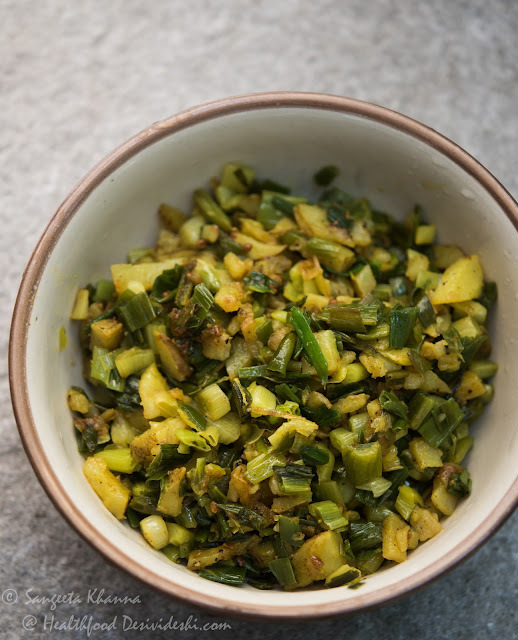 Someone was talking about sagga pyaz on Instagram when I was reminded of this subzi known as sagga pyaz, a quick stir fry that is replete with the rustic flavour of spring onion, often quite sharp when it is the spring of red onions. But it is a much loved subzi because of this sharpness for some people, we like to tone down the sharpness by adding some new potatoes of the season to sagga pyaz. Clean and chop the spring onions in small bits, keeping the white and green parts separate. Clean and chop the potato in small bits too. No need to peel the potato if it is clean and unblemished. Heat mustard oil, add the fenugreek seeds, chopped chillies and let them get aromatic before proceeding. Add the chopped potatoes, salt and turmeric powder and stir to mix. Cook for 2 minutes before adding the white parts of the spring onion and cook for a couple of minutes while stirring it all. Now add the green parts of the spring onion, mix well and cook only till the greens get wilted. The sagga pyaz subzi is done. Serve hot or warm or even at room temperature, this subzi is a great side dish for Indian thali meals. I remember this sagga pyaz subzi used to be our lunch box meal sometimes with parathas, during the school days. I remember eating this subzi with bajre ki roti and white butter too and sometimes just rolled up in a roti to make a quick snack. We use our subzis in so many ways if we like them. Sagga pyaz is one of those in my home, although I have met a few people who are intolerant to the strong aroma of the onion in the spring onions and can't eat it at all. Make some sagga pyaz ki subzi if you like it, else capitalise on other greens of the winter season.